Humpback whale sightings have exploded off the East Coast in recent years, and there are now even whale-watching cruises that leave from Queens and Belmar. 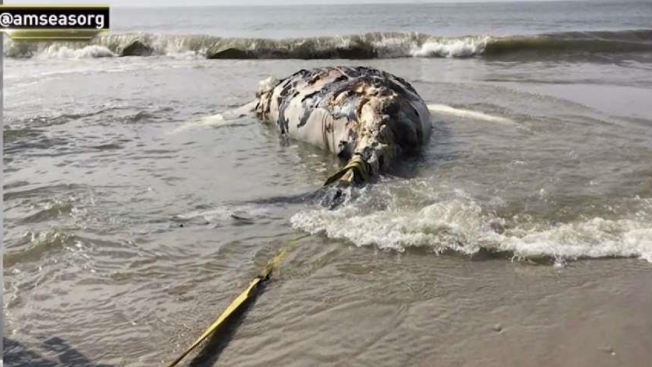 But deaths from apparent ship strikes have escalated as well, with five dead whales found washed up on New Jersey and New York beaches in 2018 alone. "It's almost like a death wish," said Steve Spinelli, captain of the Skylarker ship. "They very people-friendly, and so when we're out there fishing it's not uncommon for the whale to come right up to the boat." At least 15 humpback whales have been spotted dead in the past two and a half years: a few years ago, a whale made a direct hit on a small boat in New York Harbor; another whale made it up the Hudson River all the way to the George Washington Bridge. But as cruise and cargo ships use the Ambrose Channel to enter and exit New York Harbor, whales have been spotted there as well, feeding on huge schools of menhaden, or bunker fish. NOAA enforces ship rules on the waters, like speed limits. But because the humpback is no longer on the endangered species list, there is no speed limit on ships coming into and out of the harbor. A spokeswoman said any such decision could be months, or even years, away.